With a spotlight on a lengthy renovation of a Grade II listed house in London's Camden, as well as shorter projects in Coatbridge in Scotland and Bootle on Merseyside. Browse content similar to Episode 79. Check below for episodes and series from the same categories and more! it's very easy to get bogged down with all the choice. think about your priorities and get on with it. Yes, find an area, set your budget, and of course, do your research. And then you might just get what you want under the hammer. Many properties go under the hammer every week. Some are ready to move into. Others require that little bit of TLC. Yes, those are the ones we love. So, what did today's buyers go for? Let's find out. which was in need of the royal treatment. in this maisonette in Coatbridge. You've got your textured walls and your textured ceilings. Well, the low price doesn't necessarily mean poor quality. set up in a former timber yard. and its appeal hasn't diminished. As far as property goes, it's only getting more desirable. The property I'm here to see is on a road that's been described as mixed. there's sometimes a lot of traffic along here. Camden Lock five minutes only over there. side street location everybody wants. anybody wants because this is the property that I'm here to see today. and had a guide price of 475,000. The building has clearly been lying empty for a very long time. building has been adequately supported and it's safe to enter. Now, you can see this was the original shop area. one family home now, and I think that's how we should treat it. Although, my goodness, you could not imagine living here in this state. You've got these old metal props holding up the ceiling. It's just completely derelict and decayed inside. In actual fact, I can see daylight coming out over there. it's seen its fair share of unwanted visitors. But the bones of the building are really rather attractive. as well as delicate woodwork on the windows. but again they're in very poor condition. Moving up, the top floor has a similar layout and a similar story. and the sad destruction of a once-gorgeous Georgian house. the woodwork and rotting joists. and whoever takes this on needs to spend and tread carefully. well, from what we can see, it's in terrible condition. So, what could you do down here? or extending the rear a bit further? on cannot come in here, rip it all out and start again. And that is because this property is Grade II listed. Now, with that, you have to adhere to certain rules and regulations. here and slap any old plaster on the wall. Uh-uh! No, you've got to use the traditional old lath and plaster. And that can be quite costly. But it does look beautiful. like skirting boards, door frames etc. So, whoever takes this on has got to think carefully. They won't be able to come in here and just do it up as they want to. It's got to stay pretty much the same as it would've been years ago. But I think that's a good thing. buildings like this one and protecting the street scene. of the rooms have to remain the same. on a like-for-like basis is an expensive business. agent to see if he thought it was all worthwhile. In my opinion, I think it is a great opportunity. this in the area don't come along every day. But what about the house itself? and provide an excellent house for a family. there's so much to be done. considering its guide price of 475,000? resell in the region of £850,000 to £900,000. for in the region of £3,300 per calendar month. all descriptions that could be applied to this place. And not one for the cautious or cash-strapped. it demands serious investment to bring it back to life. Let's see who made the commitment at the auction. Big corner premises, shop, resi, not going to go below 400 anyway. The shocking condition didn't put buyers off, and the bids flew in. 532, first time, second time, third and last time, are we all done? The successful bid of 532 grand came from Londoner John. Lucy went along to find out. -John, lovely to meet you today, congratulations. I suppose I want to know why you wanted this. The principal reason is to have it as my own family home. The children have already selected which bedrooms they want. and say, "Well, how's it going to turn out?" -So working as an architect, working with buildings all my life. I think we could achieve it. I mean, this is an architect's dream. Surely? To get their hands on something like this? No, it's an architect's nightmare! Nightmare because there are so many rules and regulations. it's in a conservation area. people going to be following my every move. so what does he have in mind? The garden is quite large for a property in Central London. The way the plan form is - it fans out to the rear. garden itself at the existing level. Wow, I mean, that is such an interesting idea. What made you think of doing something like that? It's just a matter of size. This building is 1,750 square feet of accommodation. Now, I can probably increase that by near on 700 square feet. So what is the room going to be? there's going to be a kitchenette adjoining it, not the main kitchen. Remember, we've got eight principal rooms in this building. adheres to and wants to protect. contemporary style and modern living standard. there will be a master en-suite bedroom. with the new bathroom on the half landing. which will lead through into the large living room. and the need to protect what was originally built here. This sounds amazing, but it also sounds expensive. it's going to cost you a fortune to do! I've got to spend £400,000. it has its value once it's restored. you've done what you're going to be doing here. How long is it going to take you to finish the project? I want to finish it within 12 months. That's the ideal time for me. A subterranean living room? I love it! manage it, an architect can. later on in the programme. It was a horse-drawn passenger barge used on the Forth and Clyde Canal. Thankfully, public transport methods have sped up a bit since then. so it's an ideal spot for commuters. Now, this is our property. It's a three bed which had a guide price of £45,000 plus. But you don't access it off the street. You access it up this alleyway. Or as we say here in Scotland, a wee closie. shared passageway in a block of flats. in this case, the door to the maisonette is. So the front door is, well, it's all a bit back to front. Inside, you have a wee square area before you come into a small hall. And then, so the first room you come to is a bathroom. sometimes you just get a shower and WC. But that might be your only bathroom. That's not everyone's cup of tea, to have it downstairs. But there might be one upstairs. And then through to a reception room which is a really, really good size. Not sure how I feel about the decor. It's very majestic. You've got red contrast against blue and a bit of gold. But the place is very, very dated. But seems structurally in good order so far. But that could easily change with a bit of a face-lift. And your windows look in good order. you just want to check that the central heating's up to scratch. Now, I spotted a wee door here. and separating the two, you have a stud wall. not a big job and then everything would be very open plan. massive room and a bathroom downstairs. And it's not what everyone desires. have it self-contained, keep in those cooking smells. from a new kitchen, it would just make all the difference. So I love the space so far. I'm just wondering if there's another bathroom upstairs. clean lines and smooth walls. is the size of this garden. It is a bit of an odd shape, it's an L-shape. better days but you could take that down. especially if parking is tricky in the area. and you have your gates leading off the road. And, you know, it's just a great selling point for a family. And not too overgrown compared to many auction property gardens. When you're looking at the property, what do most people want? Good, solid building? We've got that. Family sized garden? We've got that. Off-street parking? Yep, we've got that. All we need now is that upstairs bathroom. and then opposite, you've got a bigger bedroom. This might be the master bedroom. but that's all easily fixed. it's a bit unusual that you have two floors above a house below. I just like it, it's just a bit unusual. So this third bedroom, you know what I'm thinking, don't you? so you don't have a bathroom upstairs. bathroom upstairs. It would just serve a family so well. you could afford to lose a wee bit of space there, put on an en-suite. side so, effectively, you have a Jack and Jill bathroom. It very much depends what you're buying this house for. If it's your forever home, you might want to spend a bit more cash. Or you might want to sell it on and add some value. If you're renting it out, maybe not so much. downstairs when the rest of the house is so good. you'd probably need the freeholder's advice. However, this property is not a freehold. no management company attached either. and what the ceiling price would be. Seems like a cue to ask an agent from the auction house who sold it. a lot of work to bring it up to standard. new bathroom, should be good to go. could sell for once renovated. I would imagine a sales price of between 70 and £75,000. probably somewhere between 550 and £575 per calendar month. This house has a fantastic amount of space. especially when you consider that lovely garden outside. Let's find out who agreed when it went under the hammer. The upper maisonette. Anybody here at £45,000? We'll move on, if there's no bids. 40 bid. At £40,000 I've got. 40 I've got, 42 now. 47 bid, and a half? After a bit of a sticky start, two bidders fought for this maisonette. 50? 49 and three quarters? 49 and three quarters, 50, anyone? At 50 I'm bid now, at 50 bid, at 50 bid, are we done? At £50,000, against you two. 50, a half, or a quarter? 50 and a half, 51? 50 and a half here, it's with you, against you two, first time. Second time, I'm selling it, all done. All out, it's all yours, sir. After some cagey bidding, the property went to Jamie for £50,500. but he's flying solo today and I can't wait to hear his plans. Jamie, pleased to meet you. So, I love this property. It feels like it's going to be small, and it's really big. It is, there's plenty of room. Three bedrooms is a great thing to have as well. So, yeah, it's a winner. Yeah. So tell me a bit about you, Jamie. Is this something you do? so I kind of just do this on the side. my wife will do them all up, painting and stuff. we'll get it back looking bang-on. And you mentioned your wife, it's a bit of a team effort? yeah, and it'll look really nice. and how many years, when did you get into this? The first one, I bought at auction, was probably about 25 years ago. so I want to make a bit more time for doing this because I enjoy it. But probably over the years, about 15? do you sell them on or do you rent them out? Yeah, you can get a good rental market money now. So just rent them out and try to get them paid off. You know, and then buy others. with the help of his wife, Arlene. So, what's the plan for this one? Paint it all, new kitchen, new bathroom. Get it all painted up, make it quite modern. Do you have any changes in mind for the layout? an en-suite, in the main bedroom. do have a big family bathroom here anyway. we'll just need to wait and see how that will work out. To have a bathroom would just be the icing on the cake. That would suit all the families as well, that are going to rent it. So it would be great for that. I think we should achieve that. And then if we go for the en-suite, it might push it over budget a bit. this will be something that you, I guess, fit in when you can? How will you manage that, is it weekends, after work? -How quickly do you hope to get it done? -I work really hard! That's basically it. That's the lesson. You're a grafter. -Well, Jamie, I can't wait to see the results. Jamie knows exactly what this property needs. A great face-lift so he can rent it out. And with his experience, I don't envisage too many problems. But you never do know. You can find out how he gets on later in the show. It's obviously not in the sparkling condition you might hope for. And back in Coatbridge, we'll see if Jamie's plans worked like a dream. It all had to come off to take the plaster work. Earlier in the show, Lucy was in the happening London Borough of Camden. It had been a shop with accommodation above. But now it was derelict in some parts and verging on dangerous. The guide price was 475,000.
and already had planning permission. Now, you can see, this was the original shop area. state that this is going to be one dwelling, one family home now. Although, my goodness, you could not imagine living here in this state! property was Grade II listed was certain to throw up a few issues. picked it up for 532,000.
he was under no illusions when it came to the reality. Nightmare, because, you know, there are so many rules and regulations. It's a listed building, it's in a conservation area. and there's lots of people going to be following my every move. when it came to the restoration. when it came to extending the footprint of the house. hefty 400 grand in total with the project scheduled to last a year. So did it all go to plan? Well, we're back, six and a half years later! but hello to stylish contemporary living. The renovation is complete, as is the lower ground extension. to see how it was achieved. dug out and we created what is now a family room. it's become the patio garden. And then, of course, we put the original garden back on this roof. is accessed through the main house. sound and there are two good-sized rooms. 1830s style of the house. there must have been some challenges. I suppose the lathe and plaster was the trickiest in a historical sense. is not a replica of an 1830s window which I truly wanted to have. So that was one of my conflicts with the conservation officer. "No, we want to see how the building has evolved over the years." So that was one of our issues. designing the extension and project managing the build. that caused the initial delay of 18 months. with the extension build starting 15 months ago. hopefully recouping some of the overspend on his £400,000 budget. I've spent on the project well over £1 million. The love of putting it in has taken it out of all proportion. we all know that it's extremely difficult. he has created something unique and amazing. However, the property market, as we know, can upset the best of plans. agent thinks of John's stunning project. to spec, up to the latest fashions. and it's a lovely mix of old and new. but will the price be right for John to sell? He's spent approximately £1.5 million on the house in total. So, what could it be worth on the sales market? If I was to market this property, I'd put a guide price of £2,750,000. 2.75, it's probably, in a good market, the right price. £1.2 million minus taxes and fees. giving him a yield of around 6%. Would that persuade John to hang on to the house? Well, I might have to if I can't actually sell the property. It's an option that I can consider. derelict building and make something special. So, how does he feel now it's complete? It's like anything you create. lets it go at the end of the day. If I was doing a painting, it would be the same thing. So, I've got to accept that and move on. and that's what I'll be doing. dominated for over 100 years by the River Mersey. most bombed borough in the UK. The houses here would probably be £600,000 to £800,000. But I'm not in London. I'm in Bootle. The houses, they're exactly the same. The guide price for this one, though, £35,000-£40,000. Well, the lower price doesn't necessarily mean poor quality. condition you might hope for, but it doesn't seem too bad. Carpets have been taken out, which certainly saves you a bit of effort. Central heating looks quite old so you might want to replace that. But a fairly standard layout. You've got a little corridor here. fire could go, which is nice. And the stairs up to your bedrooms. Through to the rear room. Now, just a tip here. You don't need two separate rooms. Take that out. then you'd go through there and you've got your kitchen. It doesn't look to be in too bad condition, actually. a relatively small house would certainly feel really nice and big. So, all in all, it's a great start. You can just keep the two rooms. I get it that not everyone likes open-plan. or a quiet one for them to do their homework. at least the kitchen would be separate. So no annoying kitchen noises to compete with the telly. However, some new flooring and a general spruce-up is needed. So upstairs, a strange kind of layout. It doesn't feel quite right. I'm sure you can sort it out, though. which I think that the old heating system used to be in. a bit of spare space. The bathroom is there. bathroom, which would be good. The bedrooms actually work really well. with some internal modifications you could do that. I quite like the feel of it as it is. if you can get away with that number of bedrooms. Nothing much to report here. You've got the bay window there. Signs of damp in that corner. Probably something simple like a gutter that's loose outside. So nothing too much to report. And in general, it's a great house. There really is nothing wrong with it at all. This house does have something slightly unusual about it. It's a leasehold property, which is more common in flats. if you are going to make any structural changes. As for the lease, there's 800 years left on that, so no worries there. you've got what you can only call a low-maintenance area. This is basically a little patio with concrete. was the original face of the building. This was added on, I guess, relatively recently. It does make the house quite energy efficient. Whether you like it or not in terms of how it looks is another thing. You are right. Looks aren't everything. And that's advice to live by. But did a local estate agent like the look of this house? thoughts on this mid-terrace guided at £35,000. The property itself is a good, sturdy two-bedroom property. Kitchen and bathroom you could almost live with. because it's almost lettable as it stands. But how much would it rent for? and perhaps be looking at a yield of around 12%. Now, what about the sales market? to be on the market at around about 46,00, 47,000. So for £35,000 to £40,000, would you buy this place? Well, the yields certainly stack up. And it's a good, solid house. Your guide on this is 35 to £40,000. No? Shall we say 30? Does 30 feel more comfortable? It does to this lady at the front. At 30 we are up and running. The bids flew back and forth in the room, and we rejoin at £39,500. 39 and a half, sir. Thank you. 40. Go on, you're nice. I'll make it 39 and three quarters. No? 39 and three quarters, this is your bid right now. Anybody want to make this £40,000? OK, here we go then. At £39,750, for the very first time. It's this lady's at 39,750. For the second time. Last chance, anybody else? Here we go. Third and final time, £39,750, you're going to get it. A very unusual number to end on. but it clinched the property for former GP, Andrea. Andrea has two daughters, Celia and Harriet. after they did some serious research looking into 25 properties. -Tell me why you wanted to buy this place? but she's working today so she couldn't come. never afford a property down there. But she still wanted to get on the property ladder. cheap in Liverpool, mum can help us manage it. -to get where she is now. Well, my now husband was born and bred in Bootle. And so he knows which streets to avoid. which was completed around seven months after purchase. But the plan wasn't originally to buy two houses. My mum accidentally bought two when she was originally going to buy one. What do you mean accidentally bought two? She got a bit happy putting her hand up at the auction! I was very frightened of going to the auction to start with. -And the other house was the one that was top of the list. This was our number two. And I just had a feeling about it. I just thought it was right. "We actually bought two, so did you want one this time?" -Well, I've got an inheritance. So it's savings that I don't actually need. OK. Wow. You end up with two. That's auctions for you. You got a bit of auction fever. Yes. John did take me out before I bought a third one. -what you saw and you went for it. Have you gone into this as a joint-venture? Are you each having a house of your own? The other one is Harriet's house. Well, tossing a coin for a house is a new one on me. is going to be doing the work, as he did for Harriet. Generally paint and decorate it, clean it completely. But there's not major work that needs doing. The first thing is the roof. We've got a roofer coming to check out the roof and clear the gutters. Mend the minor bits of damp and carpet it. And fully put blinds up and curtains up and then rent it out. -And who's going to manage the rental? -You are going to do it? Are you going to get somebody to get you a tenant or not? No. We'll do that. John will help. It seems like Andrea has this place all figured out. and hope to finish within two to three months. will she be returning to the auctions again? Not until we've done these two, see how it goes. I see. But never say never? It's a fun story. Good luck with it. -Look forward to seeing how you get on. -Nice to meet you both. without needing to be a multimillionaire. How will the family get on sorting this place out? Well, one of our buyers has finished their race. Will the other two reach the finish line, or will they come up short? and the town of Coatbridge. I had a look at a three bed upper maisonette guided at £45,000 plus. And the whole place was a tad dated. good proportions and bags of potential. And there was only one negative I could see. you have three pretty good-sized rooms. I'm struggling to find negatives on this house. plus off-street parking, which is always a bonus. The bidders could see the potential on auction day. but, as ever, there can only be one who succeeds. ago as a bit of a hobby. Not so much a work-life balance as a work-work balance. and was going to rip it out and start again. strip wallpaper, carpets, all these wee old-fashioned things. Jamie could stretch his £7,500 budget. But he was going to do most of the work himself. later to see what's different about this maisonette. re-plastering all the walls, making it look modern and clean. He even installed a new kitchen complete with fresh tiling. As for the bathroom downstairs, that's been modernised as well. But did Jamie manage to fit an en-suite upstairs? measurements, it was taking most of the bedroom away. and I didn't feel it would add any value onto the property. with a contemporary white and grey colour scheme. It hasn't exactly been straightforward getting here though. The biggest challenge was removing all the wallpaper. and the dreaded woodchip was on it as well. So it all had to come off, to take the plasterwork. Removing textured wallpaper is a nightmare. I feel your pain, Jamie. And to get through it all, he drafted in help. to help me with the plastering. But we were just all clearing stuff out. We had six pick-up loads to take away and dump. they cleared all this away, replastered. So there was a good few of us got stuck in. I have some friends that do the joinery work. They came and charged me, so they're not that friendly! As per your request, we've kept that bit in for you, Jamie. But did he manage to keep to his budget of £7,500? Very rarely does it go to budget. We went a bit higher. We're actually on about £9,500. at the round sum of £60,000. But will Jamie reap any profit back from his auction purchase? to get their thoughts on this one. Starting with the expert who saw the property last time. buyer has brought it up to a good standard. The main selling points would be the size of the property. Especially the family-sized kitchen and lounge too. The standard of finish is good. significantly to the value, although may have added to the desirability. even though his original intention was to rent the property. How much could it make on the sales market? I would suggest a sales price of approximately £75,000. Now, what about on the rental market? of £600 per calendar month. I would suggest this property would achieve £550 per calendar month. and could stretch to 12% with the top valuation. But having a long-term tenant is a real bonus. So a successful job by Jamie. Any tips for any other would-be property hobbyists? because it can be a lot of fun. guided at 35 to £40,000. except it wasn't quite watertight. And in general, you know, it's a great house. one for each of her daughters. Who got which was decided by the toss of a coin. while this one was sister Celia's. But that hadn't really been the plan. Mum had accidentally bought two when she was originally going to buy one. What do you mean, accidentally bought two? Andrea had caught a little bit of auction fever. a third property on the day. refurbishments and Andrea managing the rentals. it ready for the rental market in two to three months. The budget, set by Celia, was 3,000 to £4,000. Nine months later, the outside looks pretty much the same. But why don't you and I get comfy? ..and admire all the work that's been done here. and repainted in neutral colours. they could use the existing kitchen units. They just installed some new appliances. and find out what behind-the-scenes work has taken place. We started with the roof, to sort the damp out and the gutters. The kitchen ceiling needed redoing fully. but we took three, replaced three radiators. because of the extra expense. They only changed the bath panel and fitted vinyl flooring. Well, they look fresh and clean. and it looks like that's been dealt with. We managed to fix that with sorting out loose tiles and the guttering. you really can save yourself a hassle. And fix loose tiles and slates straightaway. A stitch in time and all that. So who was responsible for all the work here? for gas, electric and the ceiling. mishap with the ceiling falling in. Now what did Andrea do to help with the work? watching and keeping John motivated. Ah, that explains the lone chair in the reception room. have they had any luck finding a new occupant for that rocker? We've always wanted to rent this out long-term. And we've already found a tenant who wants it long-term. That will be great news for Celia. Renovating this home took longer than expected. So did this have an impact on their £3,000 to £4,000 budget? we had to pay the other person's costs as well. that we were doing, council tax has crept up. it was 4,000 to actually do the work. which gives them a total investment in this property of 47,750.
agent who saw the property last time. for a tenant or a buyer would be a successful viewing. The decor is consistent throughout. Very neutral. It looks like they've done a really good job throughout. So how does that reflect in sales values on this £47,750 investment? you'd be looking at a figure around about £57,000. I would expect it to fetch anywhere between £60,000 and £65,000. But it is for a long-term rent. profit of 17,250 quid, minus any taxes and fees. But let's get those all-important rental figures. ranges between £400 and £450 per calendar month. I would suggest £425 a month is a very achievable figure for here. And that fits with what we're getting, which is 450.
which will go towards Celia's living costs while she works in London. So will Andrea and her husband, John, be back at the auction soon? John's keen to go back to the auction. But we have a lot of work to do on our own bungalow. Does this mean John has the auction bug? John's definitely got the bug. Hopefully our stories have given you food for thought. heading down to your local auction right now. on Homes Under The Hammer. A stunning renovation of a Grade II listed house in London's Camden, which took more than six years to complete, as well as shorter projects in Coatbridge in Scotland and Bootle on Merseyside come under the spotlight. 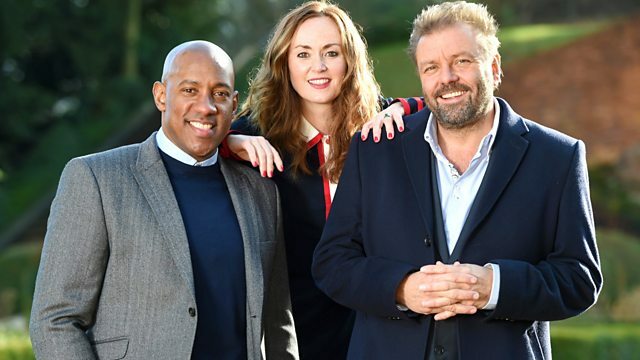 Martin Roberts, Lucy Alexander and Martel Maxwell talk to the new owners, who are hoping to make a healthy profit.